Geri D' Fyniz sets the record straight by emphatically declaring that he means everything that he says no matter who agrees or disagrees with it. 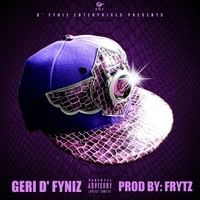 Geri D' Fyniz prefers for people to "Talk Black" aka keep it Original aka Real with him. Now he follows up the request with assurance to everyone that he will do the same no matter who likes it or not. Don't ask for nothing from my bag.